"From Light-emitting diods (LEDs) to proteins": Embedded in several interdisciplinary and international cooperations, the faculty of Chemistry and Biochemistry spans four major areas of research: Biomolecular Chemistry, Molecular Chemistry, Catalysis on Surfaces and Functional Materials. Bochum's Faculty is unique in Germany because of its interdisciplinary research foci, which are interwoven under the roof of Interfacial Systems Chemistry and cooperate interdisciplinary. Systems Chemistry is a joint approach of all chemical disciplines to transfer the deep microscopic insights obtained for small reaction systems in recent years to more complex chemical systems of hundreds or even thousands of atoms and interacting molecules in biological interacting systems. The interaction of molecules via weak intermolecular forces is of largest interest to both chemistry and biochemistry. These “non-covalent” interactions determine the physicochemical properties of molecular crystals and the structure of proteins. Nearly all biological processes up the cell functions depend on these non-covalent interactions in a fundamental way. However, it is still not possible to predict their macroscopic properties and structures from microscopic properties of individual molecules. Due to the complexity of this holistic approach, the thematic priority initially focuses on important phenomena occurring at interfaces. Collaborative research projects currently comprise weak interactions between small and highly reactive molecules interactions at single crystal surfaces and nanoparticles, the in-depth understanding of heterogeneous catalysis, complex molecular assemblies in organic electronics and functional coordination polymers, self-replication mechanisms and complex biomolecular interaction systems. In this field, researchers focus on the question, how biological processes proceed on the molecular scale and how they have developed. 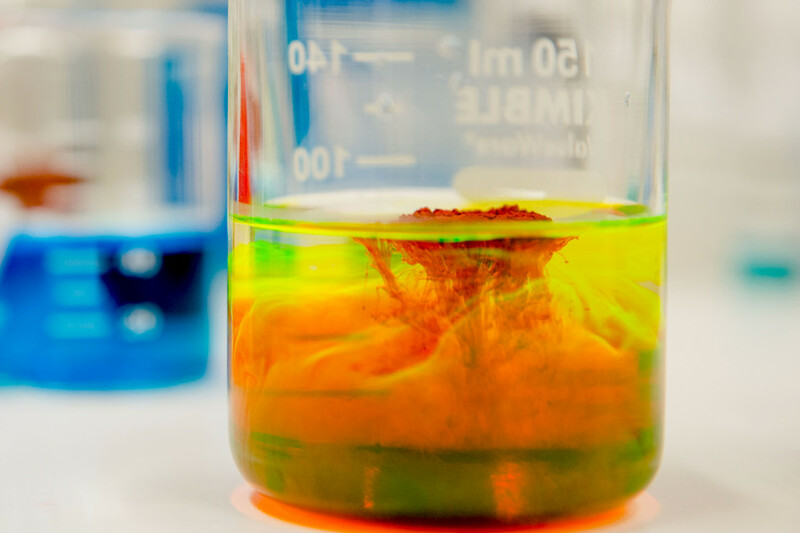 Within this area we find different fields like Bioorganic Chemistry, Biophysical Chemistry, Natural Compound Chemistry, Electro-analytical Chemistry and Sensor Technology as well as Theoretical Chemistry. On the highest degree of complexity of the studied systems, we find Bochemistry, interwoven with Biology, Medicine and the Max-Planck Institute for Molecular Physiology in Dortmund, jointly studying biochemical structures and processes. An integral part of Interfacial Systems Chemistry and also closely related to Biomolecular Chemistry, is the research on novel functional materials and the deeper understanding of catalytic processes on surfaces, bridging the different research foci. Material science and catalysis research provide the link from theoretical and experimental work to applied science. The aim of the Interdisciplinary Centre for Advanced Materials Simulations (ICAMS) is to develop new methods for the computer simulation of modern materials and to implement these into industrial applications. Materials with specific tailored properties are required for new products. Automotive industry, for example, requires high-strength steels for lighter-weight constructions in order to reduce power consumption and increase safety. With our participation in ICAMS we connect to the forefront of materials science research. Crucial for the success is the joint effort with the engineering sciences. With these foci and the multifaceted cooperatively supported projects, Bochum's Faculty of Chemistry and Biochemistry belongs to the top faculties in Northrhein-Westfalia with respect to third party founding. The German Research Foundation has released the Funding Atlas 2018. When compared to the previous report, the Bochum-based university has significantly improved its performance in many of its main research disciplines. We offer ideal conditions for interdisciplinary and international research to young scientists - PhD-students, junior professors, "habilitationists" and junior teams. Within our Graduate School of Chemistry and Biochemistry 200 young scientists from all over the world are now doing research. Furthermore, we participate in RUB's International Graduate School of Neuroscience (IGSN) - the "open faculty" for PhD-students in neuro science and brain research - as well as in Bochum's central Research School for young scientists of all faculties and the international Max-Planck Research School for Surface and Interface Engineering in Advanced Materials (SURMAT) in Düsseldorf. The junior professors, "habilitationists" and leaders of junior teams have access to central facilities of the faculty and can thus very early develop their career with great independence.